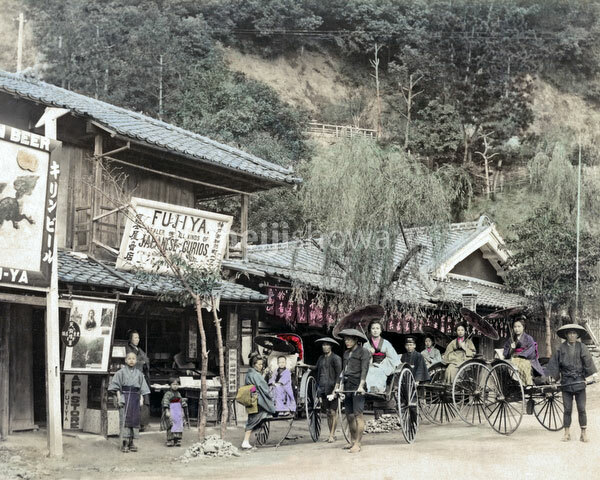 Rickshaws in front of the Fujiya (富士屋商店) photograph and curio store in Kanoucho (加納町) on the road to Nunobiki Falls (布引の滝) in Kobe, Hyogo Prefecture. The building on the right is Suehirotei (末廣亭), a tea house. This is now the location of Shin-Kobe Station. Nunobiki Falls was a very popular tourist attraction.